Wow, the storm has just subsided here and the entire time it was thundering and lightening, I was preoccupied with this gorgeous MDF clock from Inky Doodles! I've used some of our upcoming stamp sets which launch at 1pm on Tuesday on this - above, I covered the base layer in kraft card and stamped a snowflake stamp (from the Swirly Tree stamp set) with versamark, then I embossed it with clear to darken the snowflake a little. I wanted something subtle, that wasn't printed from a CD. The next layer, I used Creative Expressions Double Sided Sticky Sheets to cover the entire layer in Treasure glitter! The next layer used some burgundy printed backing paper from the new Simply Christmas CD and then finally, I repeated the sticky-sheet step to add glitter to the roof! 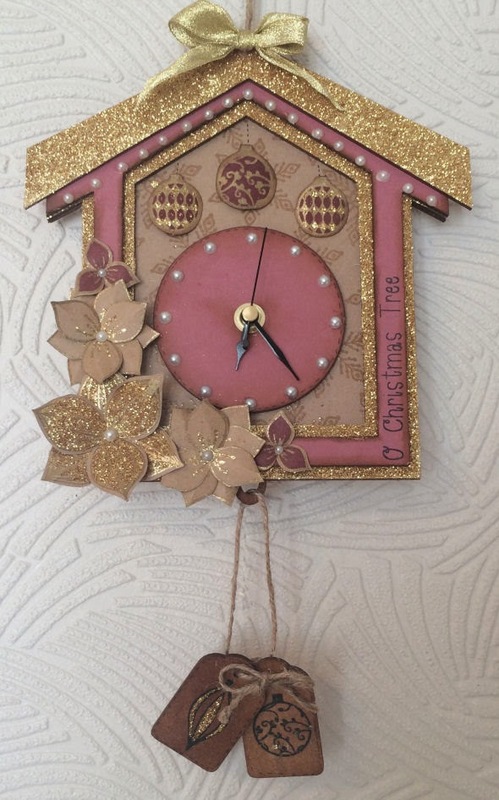 The circular clock piece, I covered again with burgundy paper and added pearls to the pre-marked holes for the numbers. My 'pendulum' is a couple of the MDF tags that come in the set (I have LOTS left over too!) and these have been distressed using Gathered Twigs, stamped a bauble in Memento, heat embossed all over with clear powder and added some Treasure glitter with a quickie glue pen. I tied these on with a bit of garden string too! The large floral decorations are from the Striped Delights stamp set, I stamped and embossed in Cosmic Shimmer Bright Gold and glittered, added detail to the stamens or coloured with 'Ruby' promarker, to create the different coloured flowers. The baubles are from the Decorative Baubles stamp set which launches on Tuesday, with these I heat embossed them in Cosmic Shimmer Bright Gold again and coloured with the Ruby promarker, then added a sprinkle of glitter! Lots of pearls were added too, plus a sentiment from the Swirly Tree stamp set (O Christmas Tree)! We're sat in the Green Room preparing for the show... join us at 10am for our brand new stamps and CD: Poppy Fields, Striped Delights and Creative Card Templates! Here are my final couple of sneak peeks... I'm a bit excited so wanted to share a few for you! Hope you enjoy the show... we're going live soon! Only one more day to go... join us tomorrow at 10am for the launch of our Poppy Fields stamp set, Striped Delights stamp set and the Creative Card Templates CD Rom! I'm sure you'll love them all! Have a lovely day... see you tomorrow, posting from the Green Room! Only a couple more days to go... here's today's sneak peek! Join us at 10am on Friday the 4th of July for our brand new stamps and CD!